Life of a Catholic Librarian: I finally don't look like Death, Pentecost novena update, and a new podcast in my queue! 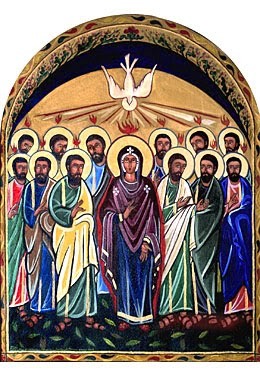 I finally don't look like Death, Pentecost novena update, and a new podcast in my queue! AHHHHHHH... I'm back at work, and finally feeling like myself again. Which is to say that my hair is brushed AND straightened, and I have actual, real clothes on! As opposed to my sick uniform of yoga pants and old tee shirt, that is. We all slept well last night too, which goes a long way, friends. That would be me, tactfully replying. We had both just been so incredibly miserable it seemed to me that a diagnosis of seasonal allergies would make me feel like a total wuss. "Yeah, it's the worst I've ever seen it this year. It has to do with the bitter winter we had. The grass and tree pollen all started at the same time, rather than being staggered throughout the spring like usual." ...but all in all, it was MUCH better than it's been. Well, for me anyway. ;-) We postponed our family birthday dinner for Anne until we were both feeling better, and that's tonight, so I'm excited! ...and it's been a really nice one so far. How's it going for you? I will talk about this more in my next video post, which I hope to have out tomorrow! Finally, I wanted to mention a new podcast that I starting subscribing to, as I did a lot of podcast listening during my two days off this week as well. Remember when I wrote back in the fall about how much I loved Serial? Well, I now subscribe to Serial's cousin, Undisclosed. Most of the podcasts I listen to are Catholic, but I like to mix it up with some of the secular persuasion as well. :) I used to listen to This American Life, and that is a *great* podcast, to be sure, but the experience was so varied for me each week. Some weeks I was gripped by the content, others were very good and educational, some were "just ok" for me, and yet others I didn't like at all. And my podcast queue is pretty full, so I just don't have room for something that isn't right on target for me each week. Serial and Undisclosed are different from This American Life in that they are both solely true crime/legal podcasts, and I *always* find those fascinating. If you've never listened to either of these, and would like to start, I would suggest going back and listening to all of the season 1 Serial episodes first, since Undisclosed really assumes that you have done so. I think the content would be very confusing if you haven't. This is my third week of listening, and I'm glad that I picked it up. It's a nice balance to the other podcasts that I listen to. Does anyone else listen to Undisclosed? What do you think of it? All right, that's it for this Wednesday. I hope to see you all tomorrow in my video post. Talk to you then!